"George Owen's yachts could even be said to be beautiful, and this adjective could only be truthfully applied to a few things in this world." Built in 1916 by Hodgdon Brothers, Boothbay Maine. Restored in 2008 by Rockport Marine, Rockport, Maine. 55 ft LOD, 37 ft LWL, 10.5 ft beam, and 7.7 ft draft with 29,000 lbs displacement. 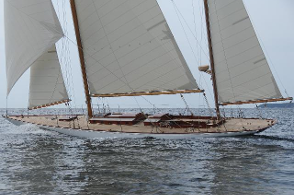 Built to Universal Rule, developed by Nat Herreshoff together with George Owen, Bernice is believed to be the last P Class boat ever built, the final design in one of the most competitive and accomplished classes of its time.